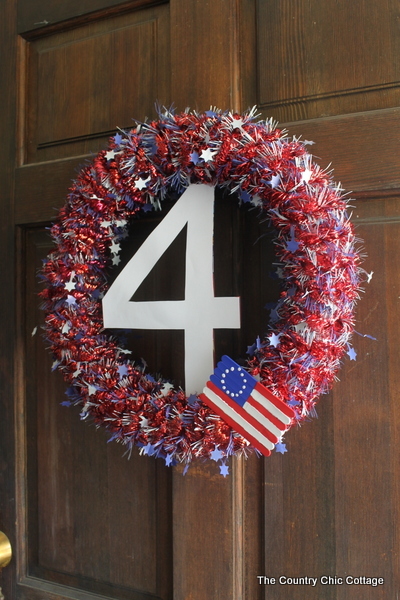 Are you ready to celebrate the 4th of July? 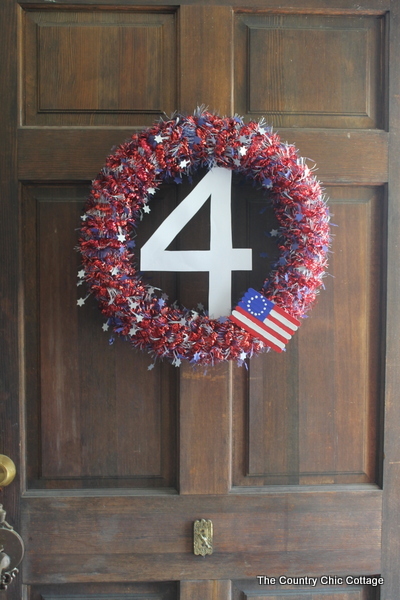 Show it on your front door with this fun wreath! 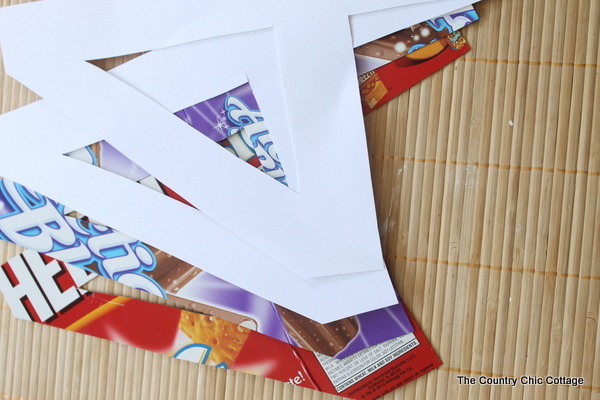 A bonus — all the supplies to make this one can be found at the Dollar Tree for less than $5. Does anyone want to guess what I used as a wreath form? Yes I jumped on the pool noodle as a wreath form bandwagon. Never seen a pool noodle wreath? Read on and I will show you how to do it! I will let y’all in on a secret. Up until this weekend, I still had my spring wreath on the door. It has been up since probably early March. It was time for a change. This wreath is very simple and cheap. 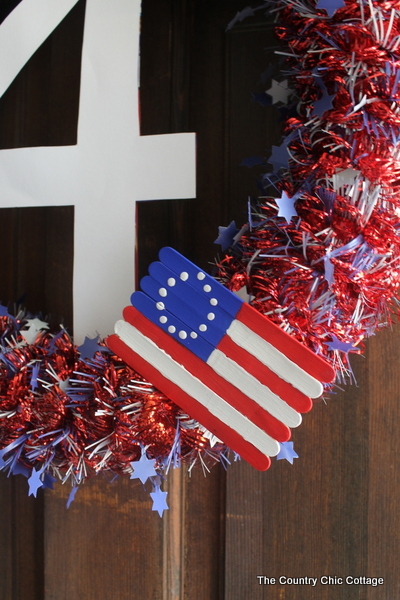 Perfect for a patriotic addition to the front door. I will say I do not know who came up with the original pool noodle wreath. If it was you, feel free to drop us a link in the comments so we can all check out your awesomeness! 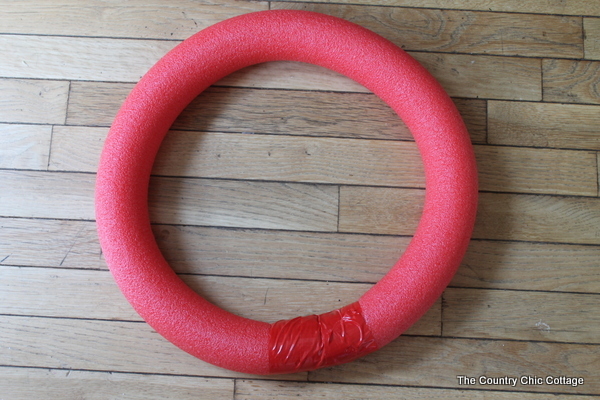 Come to think of it, if you have made a pool noodle wreath AT ALL drop me a link! 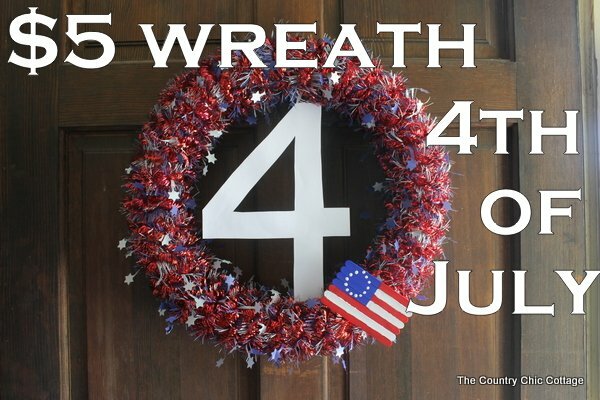 After making my first one, this is really the ONLY wreath form I will ever use again! So I grabbed a pool noodle and three garlands at the Dollar Tree for a grand total of $4. 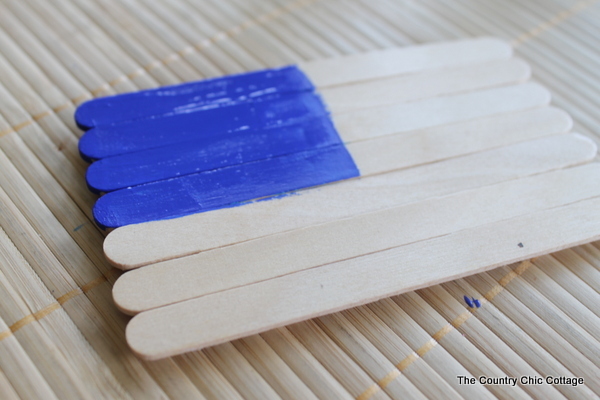 You have an extra dollar to get the popsicle sticks for the flag if you don’t have any….$5! I did not even glue these garlands. I just tucked then ends in when I came to them. Just wrap around until the wreath is complete. Three garlands barely cover the wreath. If you get a fourth, I would guess you would use half of it. I just used three and spaced them out accordingly. I think the coverage is perfect. 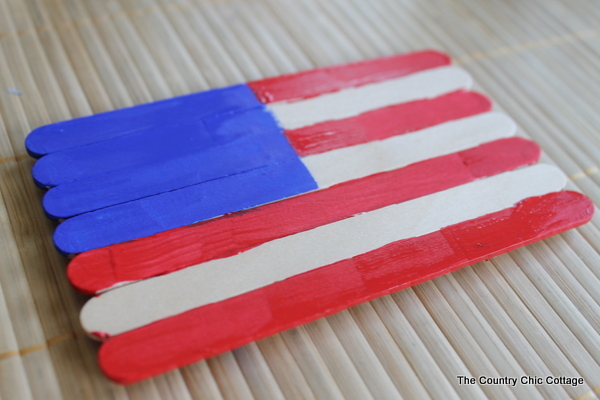 Now to make a mini American flag. 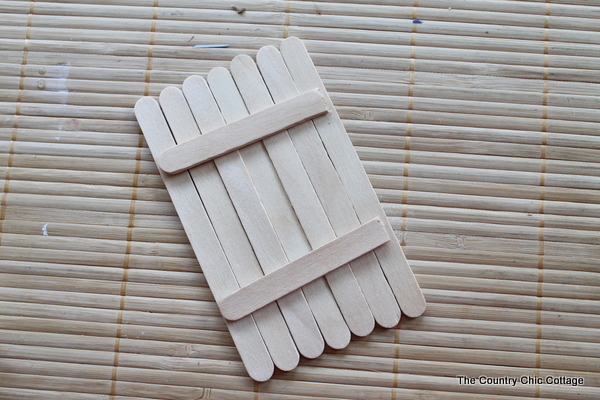 You will need popsicle sticks and craft paints. I had all of this on hand. I stacked 7 sticks then cut two more off to make a surface to glue to. I started with the blue square in the corner. I just eye balled the size. I then painted the stripes…. 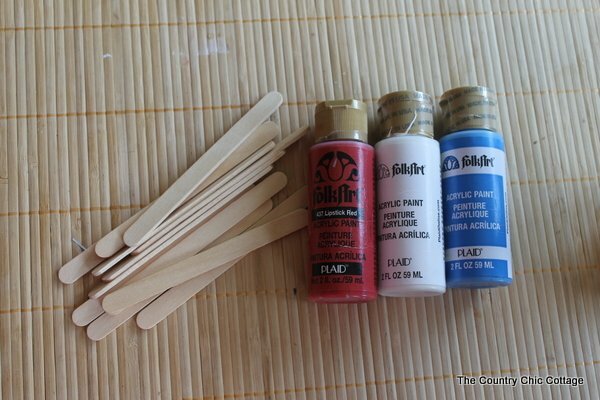 Then use the opposite end of your brush (the end without bristles) to add 13 dots to the blue portion. Let that dry. Now we are going to made the four for the center. I cut a four from paper then used that as a template. 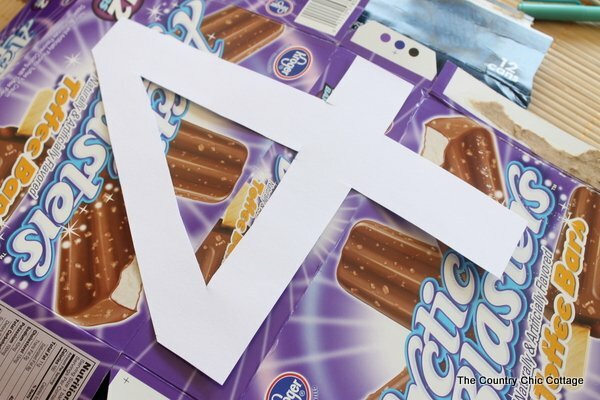 I used various old boxes to make some more fours…. I just used four layers. I then glued these together like a sandwich. It is almost like your are making your own chipboard letter. The cardboard boxes make the four more stable and able to stand up in the center of your wreath. 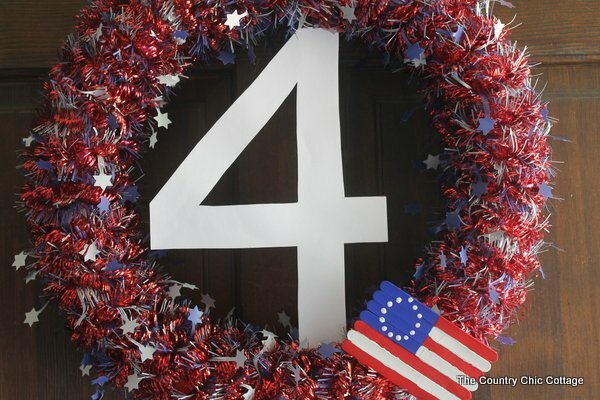 I then just used hot glue to secure the four and the flag to my wreath. 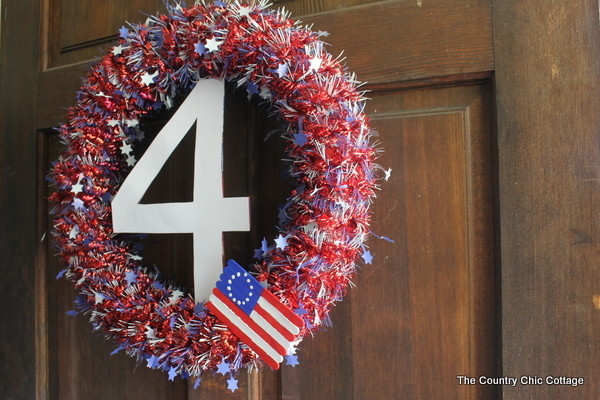 Now all of my guests can be welcomed by this wreath celebrating America this holiday season. Y’all come on by our house anytime and party like the fourth of July! We will be! Again, show off in the comments if you have made a pool noodle wreath. I want to see yours and tell me how much you love em! Never made one? What are you waiting for? Head to the Dollar Tree today and pick up your supplies! Linking up to Tutorials and Tips at Home Stories A to Z. 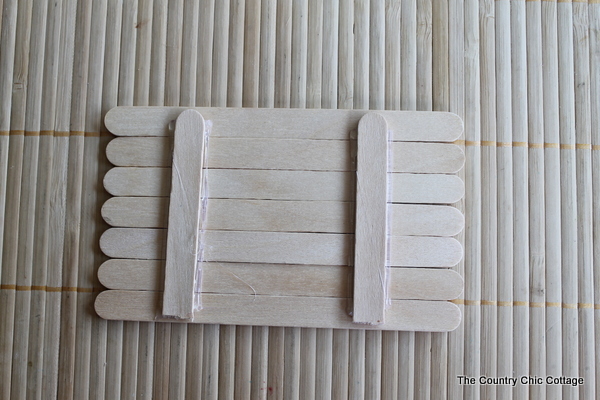 Linking up to the $5 Challenge over at Dollar Store Crafts. So creative Angie, I love it! 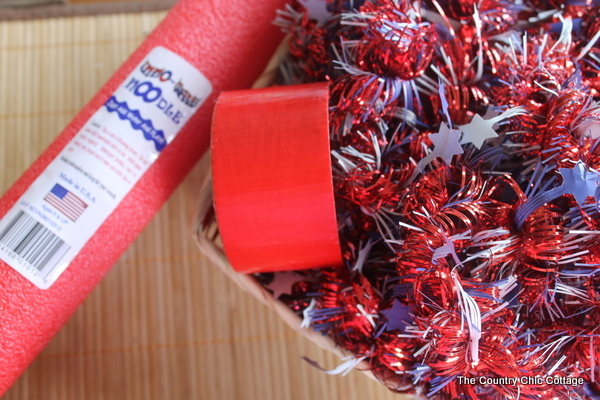 I am going to the $1 store to see if it has any pool noodles and make me a new July 4th wreath! Stunningly simple. Makes me want to celebrate July 4th. (I live in England). Cute!! 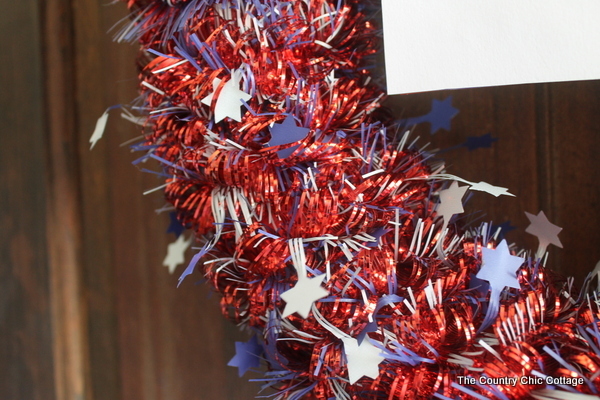 I love the garland you chose – it’s so intricate, messy and interesting (in a great way). The craft stick flag is adorable! Thanks for joining the $5 challenge. This is very sparkly and cute! Saw you at the craft challenge =) Good luck. How did you secure everything once it on the wreath? Like the flag and did you just wrap it and if so how did you get to stay? Love it. Just a dab of hot glue should work fine Angel.